Killing reporters here is only one element in a campaign of state terror. Xalapa, Mexico—This pleasant colonial city in the foothills of the Sierra Madre Oriental mountains, the capital of Veracruz state, is deceptively calm. Despite the surface normality, Veracruz may be the most dangerous place in the world to be a journalist. In the past seven years, a total of 25 reporters have been murdered, and another four have disappeared, according to the journalists I’ve talked to here. One more reporter has just been murdered in Veracruz state, on March 21. Leobardo Vázquez, who ran a news website, had apparently gotten threats from local officials. By contrast, in the entire United States, over the past 16 years only one journalist has been murdered for doing his job. Despite the danger, some reporters here keep on reporting, as I just learned during several days of intense conversations with some of the most courageous people I have ever met. Murdering journalists in Veracruz is only one element in a campaign of state terror—one that, according to widespread allegations, was organized and abetted by the former governor of Veracruz and the one-time head of his statewide security force. In the decade preceding 2016, the official number of people who disappeared was only 2,750, but other estimates by victims’ organizations oscillate between 4,000 and 20,000. The fear that the 8 million people of this state have lived with is only part of a rising wave of violence and corruption that is spreading across Mexico, for which the ruling elite is mainly responsible. In spite of Mexico’s worst crisis in a century, that elite continues to count on the support of the United States. What’s more, the US mainstream press has failed to adequately cover the heroic struggle of its colleagues who live and work just a few hours to the south. As a result, in the United States a false image of Mexico as a hopeless land of passive victims continues to persist. Noé Zavaleta, the local correspondent of Proceso, the distinguished national weekly, is a very tall, energetic 37-year-old who inherited his post after his predecessor, Regina Martinez, was beaten to death in her home in 2012. During one six-month stretch, Zavaleta moved around with armed bodyguards, and he still cautiously directs taxicabs to drop him off down the street from his home. Miguel Ángel Díaz, a thoughtful man of 43, had made a career as a successful mainstream TV reporter, specializing in documentaries. But he couldn’t report freely, so he and several colleagues started an impressive independent news site called Plumas Libres ,“Free” or “Independent Pens”. “In Veracruz, an alliance between criminal groups and the highest levels of local political power paved the way to an unbridled campaign of violence…” according to the International Crisis Group. Their friend, a colorful, brave 31-year-old news photographer named Rubén Espinosa, was murdered in 2015. Espinosa knew he was risking his life by publishing such photos of Duarte, whose vanity and sensitivity were well known. Duarte’s longtime friend and right-hand man was Arturo Bermudez, the head of the Veracruz State security apparatus. Bermudez, also known as "Capitan Tormenta" or “Captain Storm,” allegedly ran death squads out of police headquarters, and he’s been accused of having links to narcotics traffickers, kidnappers, and extortionists. More than 100 narcofosas have been discovered in Veracruz; one of them is expected to contain between 500 and 570 bodies. As the terror grew, photographer Espinosa moved to Mexico City, hoping to be safe. Miguel Ángel Díaz saw him there just before he was murdered. “Rubén was agitated and nervous,” Díaz remembered. 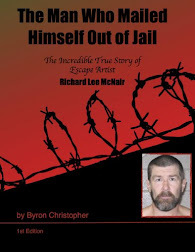 “An unknown person had just recently approached him in a restaurant, and spoke to him by name.” A week later, Espinosa was shot in his apartment, after having apparently been first tortured. Rubén Espinosa’s death did not silence his friends. They risked their lives and kept on reporting. After Espinosa’s murder, Díaz made a 10-minute documentary about him, in which the young photographer’s legendary zest for life and courage shine through. The video, available on YouTube, has English subtitles. Espinosa’s death did not silence his friends. They risked their lives and kept on reporting; Zavaleta even published a book-length indictment titled "The Hell of Javier Duarte: Chronicles of a Fateful Government" and put one of Espinosa’s unflattering photos of Duarte right on the cover. And they protested publicly, right in Xalapa’s central plaza in front of the state government headquarters, where they marched alongside students from the local university, mothers of the disappeared, environmentalists, and others. After several years, the independent reporters won a partial victory. Their relentless publicity about the wave of terror prevented a cover-up. Ex-Governor Duarte and Captain Storm are now sitting in prison, as a prosecutor draws up charges. The independent journalists here are not celebrating. Díaz fears that the relative lull could just be a strategic pause, meant to avoid bad publicity before the July 1 nationwide elections. They agree that no serious probe into the deaths of any of their colleagues is taking place. Mexico has long been known as the land of the mordida, or bite, the preferred manner to settle a traffic infraction with a police officer. But over the past few decades corruption at the highest levels of government has shot up—and is now measured in billions of dollars. Noe Zavaleta estimates that during ex-Governor Duarte’s six-year term, he and his entourage stole as much as 35 percent of the state’s entire budget. The La Jornada Veracruz newspaper just reported that Duarte and his predecessor robbed so much that it will take until 2047 to pay back the state’s gigantic debt. Duarte has already been caught with 40 properties in the Houston, Texas, area, and he is suspected of having bought others in Miami, New York City, and elsewhere. Duarte is not an isolated example of mega-theft. Since 2010, at least 11 state governors have been investigated for corruption, out of Mexico’s 31 states. The Crisis Group reported that the total missing nationwide is at least $15 billion. 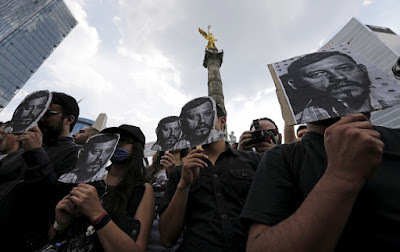 The nationwide crisis is weakening the control of the Mexican elite. The ruling Institutional Revolutionary Party (PRI), in power for most of the past 89 years, is discredited, partly because criminals like ex-governor Duarte were among its leaders. Resistance continues to grow. Parents of the 43 college students who were disappeared in 2014 in Ayotzinapa, Guerrero state, and whose bodies have never been found, are leading a movement demanding answers. Militant teachers continue to organize strikes and highway blockades, protests that increased after a widely publicized massacre at Nochixtlán, Oaxaca state, in June 2016. Napoleón Gómez Urrutia, a militant leader of the National Miners Union who has been living in exile in Canada, is returning soon to run for the Senate, and more than 10,000 of his supporters marched through a Pacific Coast port to support him. This resistance, along with disgust at the ruling elite, is a major reason the leader of the moderate left, Andrés Manuel López Obrador, AMLO ie, continues to lead comfortably in the opinion polls for the July 1 presidential election. But no one is celebrating yet. The view here is that AMLO, as he is universally known, will need at least a five-point margin on election day to make sure his victory is not stolen. The Mexican people have made their own history over the centuries, and they will continue to do so. In 1988, the insurgent, and honest, reformer Cuauhtémoc Cárdenas actually won the presidential election, but the ruling PRI stole it—and there was no protest from Washington. In 1994, the Clinton administration and the Mexican government enacted NAFTA, even though experts warned that the misnamed “trade” agreement—it was actually a “pro-corporate” deal—would fail. The experts turned out to be right; NAFTA did not dramatically boost Mexican growth as promised, and it seriously damaged the country’s big agricultural sector, forcing nearly 5 million Mexican farmers into unemployment, many of whom had no choice but to trek to the United States. In 2004, the US ban on the sale of assault rifles expired, and the weapons started flowing southward, where they were used in battles between competing drug cartels. By one estimate, over 250,000 US guns are exported to Mexico each year, and 70 percent of the weapons recovered at Mexican crime scenes can be traced to US sales. The 2008 Mérida Initiative, signed by President George W. Bush, has allocated $2.5 billion of US funds to a militarized War on Drugs in Mexico, an effort that by any measure has failed. Casualty estimates vary wildly, but one figure estimates that there have been over 230,000 homicides in Mexico since the “war on drugs” began 11 years ago. Despite the carnage, drug trafficking has not stopped, and in some parts of the country, the violence has actually increased because the drug cartels have splintered and fight each other viciously over smuggling routes. Miguel Ángel Díaz points out, “The United States sends the bullets here to Mexico, but the drug consumers are nearly all up there.” If the United States had launched the same military onslaught within our own borders, sending thousands of troops into some of our major cities, public horror would have halted it within a week. Meanwhile, journalists here in Veracruz continue to risk their lives—along with reporters elsewhere in the country. 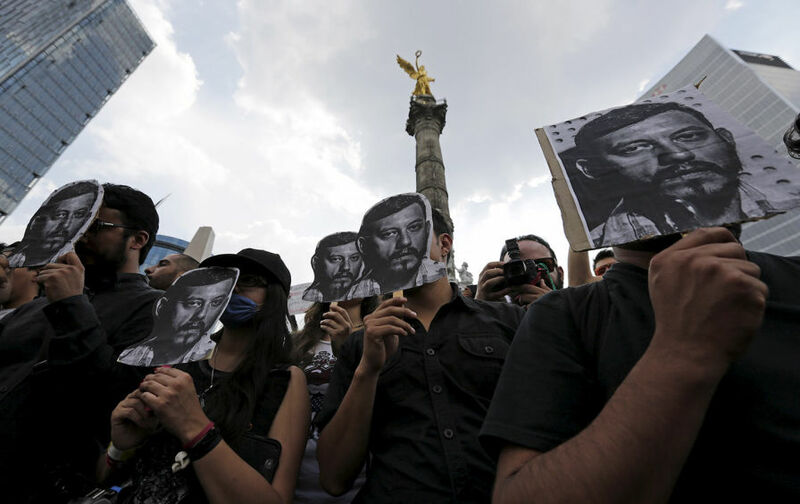 One estimate is that since 2000, at least 104 Mexican journalists have been murdered, and 25 more have disappeared. The US mainstream press should be loudly demonstrating solidarity with their Mexican colleagues. The Committee to Protect Journalists, the CPJ, based in New York, does outstanding work in monitoring the killings, including a long report in May 2017, but then there is feeble follow-up from the big American newspapers and television news networks. Everyone talks. If you don’t know that you’ve never been to jail or interrogated. You had me until the author started blaming all of Mexico's problems on America and Americans. After that, I stopped caring. There was not much blaming, just few facts. IMHO this is not anti-USA article at all. --The we start FACT CHECKING, and find the truth is thousands of times worse...FACT! American people are not at fault, they’re definitely not helping tho. That pointed finger goes both ways. Global usage is evident. Drugs and corruption is everywhere. It’s outside everyone’s front door. I believe that these are some of the bravest people on the planet who care about their country. I hope one day that they will be honoured in a significant way by the people of Mexico. --Thanks for doing a good job here Yaqui, it was about time. That's rude. Well "it's about time" you learned to appreciate a good article when you read one. 9:48 Sardonic sarcasms are still a good form of a backhanded compliment, I really really like this report. 2.5 billion dollars on a war that is virtually unbeatable? I say otherwise! The war on drugs and weapons going south can be won. That is if those corrupt governing politicians / government officials were sincere ( Referring to both countries). Money is the culprit here like anywhere! As for those fine journalist? Not many will walk in their shoes. Much less the stomach to dedicate oneself by shedding light to injustices / criminal behavior.